CREAte are pleased to announce that their next symposium will be taking place on Thursday 25th June 2015. The event is being organised by CREAte (Centre for Research in European Architecture) as part of the 10th anniversary celebrations of the Kent School of Architecture, and will be graciously hosted by the Twentieth Century Society. In the 1930s the field of planning in Europe became established at the regional and even national scales, embracing the drive towards modernisation through the creation of new infrastructure such as highway systems and electrification projects. At the same time, countryside planning and related conservation efforts aimed to protect and integrate historic and natural landscapes. The advent of World War II provided a new impetus to planning at all levels, for it demanded the mobilisation of all forces, not only military. European planners continued to look beyond the end of the War, envisioning a new, more orderly world of the future. 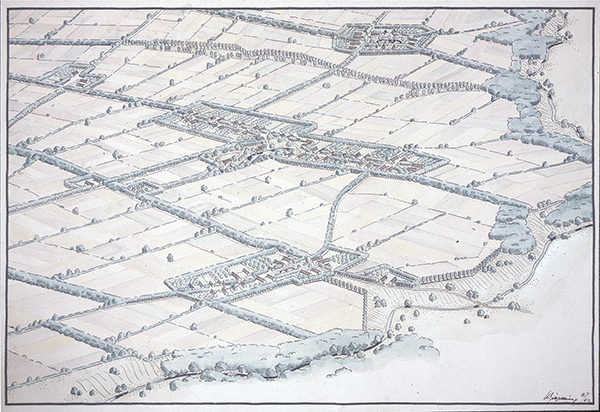 As the historian Niels Gutschow recently noted, one British planner referred to the destruction of Coventry as a ‘blessing in disguise’, for it provided a blank slate for new plans. Planning histories of this period are usually read through the lens of the politics of the individual countries involved, focussing on how planners responded to either democratic or dictatorial regimes, both during and after the War. However, is it possible that the drive towards modernisation and totalising modern planning at the regional and even continental scales could have its own innate logic, with attendant political and social consequences? And could this internal dynamic reveal unexpected facets of modernist thinking as a whole? This symposium considers planning from ca. 1935 – 1950 in Britain, France, and Germany (and tangentially the US), beginning with presentations on the individual countries, and ending with a collective discussion among the symposium participants on historical differences and commonalities. While these topics have been considered broadly before, here the focus will be particularly upon the town and country problematic as manifested in this period. The symposium will take place in London on Thursday 25th June 2015 from 5pm, KSA staff and students will get in free with their University ID, others can pay through the 20th Century Society either online or at the door. To register for the event, please visit the Twentieth Century Society website or contact Dr David. H Haney for further information. A talk by Professor Simon Pepper about impact for architectural historians will be held at the same venue immediately before-hand. For details, please contact Dr Timothy Brittain-Catlin. Image: Agricultural “village-landscape” plan for the eastern territories, by landscape architect Heinrich Wiepking, early 1940s.